Rutgers Association of Planning and Policy Students: Stormwater Tuesdays: You Design It! I have so much more I could tell you about why we need to manage stormwawter sustainably (rainwater as art... rainwater as an educational opportunity... rainwater as an important resource...) but I stumbled on a great case study of green stormwater infrastructure so I am going to dive right into the first case study for this series. Maplewood is a small town of 38,000 with a big passion for rain gardens; so much so that they have established a program to implement as many rain gardens as possible whenever there is a city street reconstruction project. Each year the City comes up with about ten new rain garden designs that land owners adjacent to the streets projects can select from. 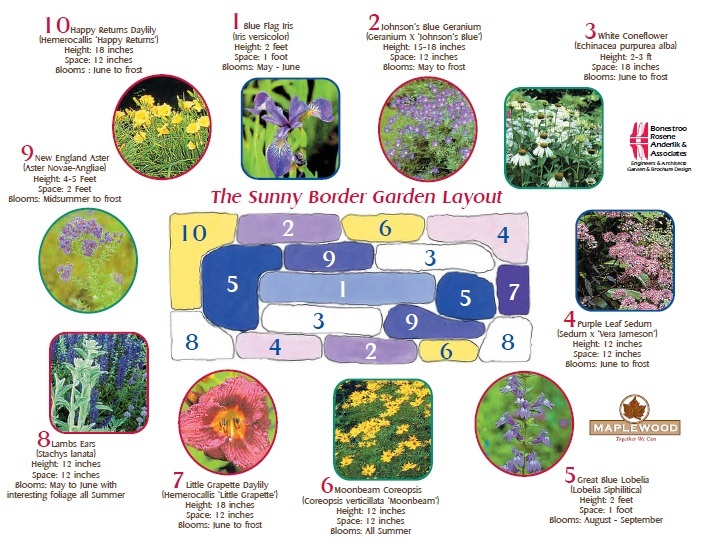 The designs are all different sizes and shapes and color combinations... even great names like "Butterfly and Friends Garden" or "Cool Whites and Jazz Brights Garden." And if that isn't enough to prove that they must be doing something right; just look at the numbers. Maplewood now has over 620 rain gardens with 60 of those on city-owned property. How much maintenance is required for a rain garden you may ask... especially for a rain garden that is meant to treat road runoff? Rain gardens are designed specifically for your climate zone and water-tolerant plants are placed in the center and upland plants along the permiter of the rain garden. Because the plants are selected for your climate zone's temperature and rainwater averages, once your rain garden is established it won't even need to be watered most of the time. 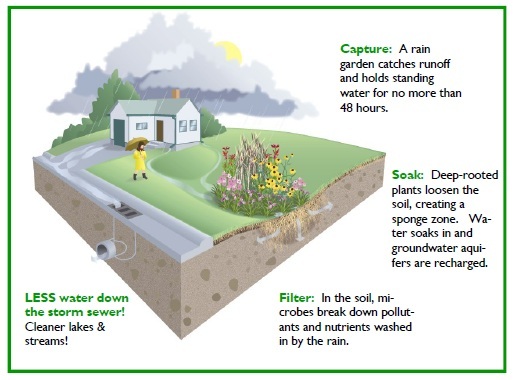 On that note, it is important to remember that rain gardens are designed to infiltratie or evaporate all of the rainwater collected within 24 hours so that mosquitoes are never a problem. One major contaminant that will end up in your rain garden is fine sediments from the road surface. Gravel and large rocks are often placed at the outfall or entrance to the rain garden to capture the fine sediment in one place where it can be easily cleaned out. Another common contaminant, especially in the winter, is salt. Therefore, salt-resistant plants are identified and selected for rain gardens in areas where salt is a common pollutant in street runoff. Other property owners are concerned that directing road runoff into a vegetated depression on their property is wrong because the contaminants from the road will hurt their plants. But no need to worry. The whole idea is to slow down the runoff and treat the runoff through the natural phytoremediation (using plants to clean up soil or water) benefits of vegetation and soil. You definitely shouldn't grow food in your rain garden but if designed correctly the plants in your rain garden will be able to withstand the runoff volumes and mild contaminants.